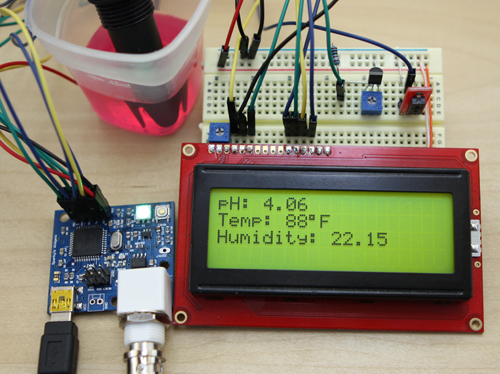 Ryan Edwards met up with the DP crew at Maker Faire and he sends in this post on his experiments with open source water quality sensors. For the last few years I have been creating open source water quality sensors. One of my other passions is Gardening and I had a need for pH and other (DO, eC) sensor interfaces for an Aeroponics setup I was creating. After not finding much on the market I decided to create my own, and as a result LeoPhi and MinipH were created. LeoPhi is a USB enabled pH interface with an Atmega32u4 onboard. It allows someone to create standalone meters, or program it however needed. MinipH is a very cost effecitve I2C pH interface meant to be added to projects very easily! It has a 12bit ADC and a fair amount put into the analog layout. And while at the MakerFaire bring a hack dinner I showed off a DIY pH meter build and have a brief write up about it. For those that want to start off from the begining and create their own interfaces I have a pH interface tutorial. I plan on getting tutorials and writeups for my other sensors as the come online (eC and DO are next). Visit Sparky’s Widgets for LeoPhi project info and code. This entry was posted on Tuesday, May 28th, 2013 at 2:00 pm	and is filed under Maker Faire, open source, sensors, USB. You can follow any responses to this entry through the RSS 2.0 feed. You can skip to the end and leave a response. Pinging is currently not allowed. Awesome, really great to see this get featured! Thanks for featuring my project DP!! Originally started back around 07ish it took me a long time to ramp everything up learning everything on the way! Just wanted to say thanks, off to my day job I hope these help some out! Awesome! I have been looking for pH (and other water quality) meter DIY ideas for my pool. Poor water quality can destroy a plaster or in-ground pool, to say nothing of making swimming unpleasant. I look forward VERY much to your other projects, and hope you will share your insights as you progress.